The Dragon Boat Festival is the top three important festival for Taiwanese. A national-wide competition including international groups are held on June 5-7, 2019. Besides, one of the best coaches is invited for training the CMU team. Last summer, we had a great time and the CMU team did a great job at the race. Please contact ISC for details or let us know if you are interested in experiencing this special event in Taiwan. 1. Date: June 5 (Wednesday) ~ June 7 (Friday), 2019. 2. Time: 13:00~20:30 (some finals will be live broadcast). 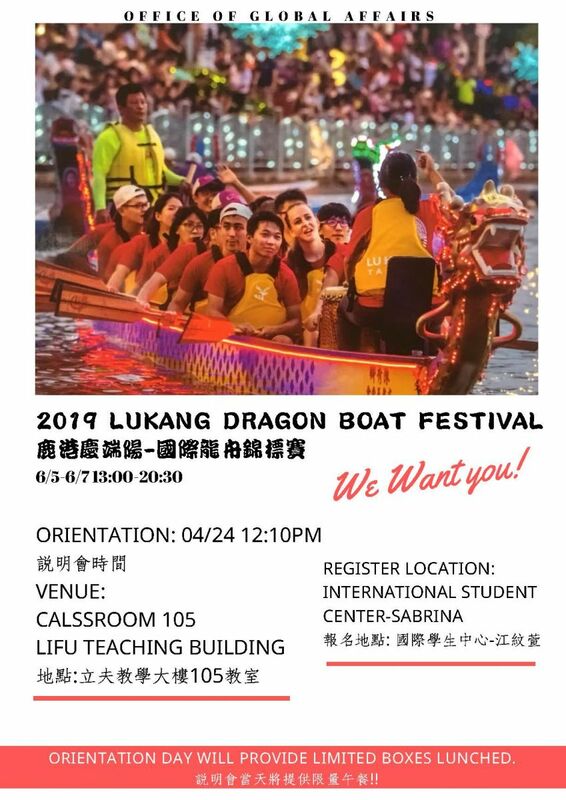 4. International Group: Domestic or foreign college students, international students & foreigners ( A minimum of seven foreign, including Mainland China, paddlers required). 5. Participants: 22 players. Players include captain, flag-picker, drummer, paddler and stand-bys. 7. Practice: About 6 times practices before competition in NTUS(Taichung) & FuLu Stream (Changhua). 8.Members: To encourage internationalization and to reach the standard of international , overseas students will be given priority, and the number of all attended members will be increased. The follow-up will be decided according to the times of participating exercises. I. Date & Time: 4/24(Wed.) 12:10p.m. III. Limited lunch boxes provide. More information about the competition please refer to attach file or visit us in office of global affairs.